We’ve been having a conversation with Dr. Thomas O’Donnell. He’s coming to us from Berlin, Germany. He’s been discussing with us the geopolitics of oil and the implications of the recent plunge in the oil prices and the relationship with Russia, China, and the United States. So thank you again for joining us, Dr. Thomas O’Donnell. DR. TOM O’DONNELL, FREE UNIVERSITY OF BERLIN: My pleasure. PERIES: So, Thomas, tell us, in the recent gas and oil deal that was made between Russia and China, at a cost of almost $400 billion, they decided to use their local currencies instead of the U.S. dollar. Why was this move so significant? O’DONNELL: Well, there’s actually some debate about how significant it is. Let’s put it this way. Immediately, it doesn’t have a lot of impact. Here we’re speaking about not just the fact that Russia has lost–is going to have significant problems with their income from oil because of the sanctions and then a falling price on top of that, but here we’re speaking more about especially gas. Russia, of course, because of their annexation of Crimea and what Putin’s up to in Eastern Ukraine, de facto more or less annexing that area also, he’s under sanctions. And right now the European Union, especially Europe, is the main market for Gazprom’s gas exports, which is a very significant part of the income of the state. So this doesn’t bode well. Under sanctions, Europe’s doing everything it can to, step-by-step, replace that gas. And so what happens is he’s looking for other markets for the gas, and he made this deal with China. Negotiations over this deal have been going on for long time, and the Chinese were basically driving a pretty hard bargain. And Russia really doesn’t have someplace else to sell a lot of this gas. The pipelines don’t all exist even right now. And so Russia made a pretty good deal. I mean, they gave the Chinese a pretty good deal, it looks like. But it’s going to take a number of years to build that pipeline. So what we have is, I guess you’d say, is just like the Americans have a pivot to Asia, Putin’s having his also pivot to Asia as a consequence of the decisions he took, the policies he’s implementing with respect to the European Union. He’s looking now to sell his gas in the future and to do business more in the future with Asia, with China, but also to include South Korea and Japan. And so, in the long run it’s significant, but in the short run it’ll take quite a period of time before there’s any large amount of gas flowing in these pipelines that have yet to be built. PERIES: Right. And Russia also canceled its pipeline agreement with Europe. Why did it do that? O’DONNELL: Well, that’s good question. You see, most of–the majority–about half the gas that’s exported from Russia to the European Union goes through the Ukraine presently. And that’s fraught with a lot of difficulties for the Russians, as well as for everybody else. Now, they had a strategy–for example, with Germany they built something called the Nord Stream Pipeline that went north around the Baltic, avoiding the former Soviet Union countries in the East and Central Europe, so more or less geopolitically secure. 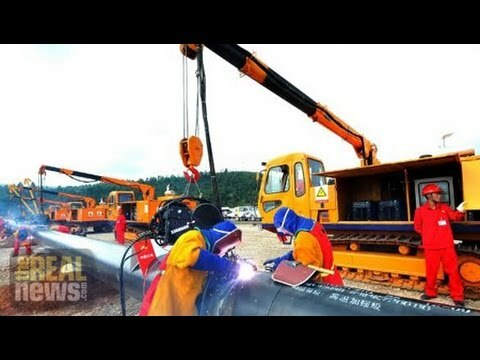 So there is some–the European Union over the last decade and more has tried very hard–and so has the United States–to foster the building of pipelines that come, say, from the Caspian region and from the Middle East to Europe, avoiding Russia, precisely with the idea that there might be these geopolitical problems. And European Union didn’t really succeed in carrying that out, and Russia was always sort of a step ahead in various ways. And the South Stream pipeline was going to be a pipeline coming through Bulgaria and other countries that would avoid Ukraine but, on the other hand, Russia would have a very heavy hand in. And the European Union objected. Under the rules of competition that the European Union has promulgated for their gas market, the supplier of gas cannot–or other hydrocarbons, but the supplier of gas cannot also be the person or the company that owns the pipeline. It gives them too much competitive advantage that can be used, in this case, for geopolitical reasons, and was giving a lot of pressure to Bulgaria and other countries not to go along with that, and also not to go along with some of the deals that Russia was imposing on the countries to absorb a lot of the cost of building the pipeline and so forth. And Putin has backed down. I think he’s seeing that he’s not going to be able to do that. PERIES: Right. And so what do you think will be the implications of all of this, the falling oil prices, the falling domestic currency for Russia? What will all this mean domestically for him? O’DONNELL: Well, even the Russian Central Bank and state now is predicting quite a considerable economic contraction next year, in all likelihood a recession. They’re using quite a bit of their reserve currency to try and prop up the ruble. They have a lot of money, a lot of currency, foreign exchange on hand, but they’re using up a lot of it. And this is sort of–again, I think you might say that once Putin decided to have this confrontation with the European Union over the Ukraine–and we’ll see; over perhaps other countries he might escalate–he may have anticipated the sanctions, but at the same time such a falling in the price of the commodity that his country is depending on. Now he’s in a very difficult situation: how is he going to persist with this? And this is going to impact the Russian people. It’s already impacting the Russian people. Of course it impacts the big oligarchs who do business in the West. The middle class gets impacted quite a bit. It’s always the middle class who’s very sensitive to the value of the currency, the availability of products, which will have a big impact on jobs and their business. But at the same time, Russia is a country without that large of a middle class. There’s a lot of really poor people spread out over a large territory. And he might feel that, well, he can soldier on with his confrontation. It remains to be seen, but he’s in a weaker position, I think, than he ever anticipated when he began this some months back. PERIES: Thomas, lower gas prices at the pump might at least temporarily stimulate part of the economy, at least in the U.S. But we’re sensing a global economic crisis, both in Europe and now with Russia. And what do you think the implications will be of the falling oil prices in the global economy now? O’DONNELL: Well, I would say, as mathematicians say, to first-order, to first-order, any country that’s a net importer, they’re going to have less of their capital going outside the country. It’s sort of–it’s almost as though everybody in the country gets a tax break, because the price of energy, the price of oil especially, but also gas, enters into, basically, every commodity that’s produced in the country, so less money will flow out. Now, you have to look country by country, for consuming countries, which ones it helps more or less. Producing countries are something else. The European Union is in difficulty. There are various economic stimulus measures that it can take to–there’s no fundamental reason it has to be in this hole. In my opinion this has to do with the economic ideology or economic policy–mistaken, I think, economic policies. And so this falling price of oil will help the European Union, clearly, and hurt Russia, as we discussed. The United States, I think it’s more of a mixed bag. It will help people that have more money in their pocket–some people have estimated [maybe (?)] $400 next year, which is like a big tax break. On the other hand, a lot of the business taking place, a lot of the business movement in the United States taking place was precisely in energy production. So if the Saudis succeed in taking that market away from the United States a bit, a lot of that will slow down in the United States also. PERIES: And will the drop in the prices of oil, a barrel of oil, mean less revenue for Saudi Arabia? O’DONNELL: Well, yes, and they’re perfectly aware of that. And that has some implications for the Saudis. They have a much larger population than they had 20 years ago and they have a lot of costs. But in OPEC, I think one thing that’s been consistent in OPEC since the beginning is there’s really two types of countries–or, actually, two factions in OPEC. And sometimes they get along fairly. When the price is high, everybody’s happy and the two factions are pretty amicable. Okay? But when prices start to drop, you start to see this split in OPEC. You have OPEC–basically, they all produce a lot of oil, but some countries have very large population. So countries like Iran, Iraq–let’s see–Iran, Iraq, and Venezuela especially, and somewhat Algeria, these are countries that have very large populations. So the actual–you can’t just look at their export revenues. It’s their export revenues per capita tells you how much money they can spend on their population. And if you compare that number to the export revenue per capita for the smaller countries around the Gulf–Qatar, U.A.E., or Saudi Arabia, which is slightly larger–it’s almost an order of magnitude more per person–seven, eight, nine, ten times the income per person. So when the price of oil starts to drop, it really hits the high-population countries very hard. They have a consistent–they always want the maximum price, because they always have problems with their budget. They might have military problems too, but they always have problems with their budget. Usually they’re following populist–might be governments that aren’t very popular with their people and are following populist policies, and they’re in big trouble when the income drops. Saudi Arabia, U.A.E., Qatar, these countries can usually adapt what we would say [is] a more businesslike model, where when the market demand changes, you lower your price to keep your market. When there’s a good situation, you let the price go up. They have the freedom to do that sort of thing, and these other countries, the other faction, doesn’t. They’re usually called the price HOP faction. PERIES: Right. So, Thomas, this is going to be an ongoing discussion, I suspect, in the coming months. PERIES: So I hope you join us again as we follow this issue on The Real News Network. O’DONNELL: Well, it’s a pleasure speaking with you.